GIVE IT TO: I don't know--upper MS mystery fans? This one is tough since I didn't really like it. SUMMARY: After being exposed to a sick puppy, Tory and her friends begin to notice new powers such as sharpened senses and super speed. ROMANTIC HEAT: Almost none. A little flirting; one side cheek "kiss" that may or may not have actually occurred. REVIEW: Oh, this book. What a mess. Right away, I noticed choppy writing, info-dumping, numerous interruptions in dialogue, and teen characters who do not act anything like teens. I can appreciate that these teens are smart, but seriously? They guessed a high-security door code on the first try? They found a hidden key to a restricted area in the first place they looked? Granted, the code and the hiding place were pretty easy to guess (convenient), but they found both of them THAT EASILY? The burial site of the body they were searching for, after 40+ years of being buried on a remote island and eluding police and grieving family members, is still apparently visible from a cursory search on Google maps. That's how Tory discovered it. WOW. And don't even get me started on why they did not contact the police when they found a HUMAN SKELETON on the island. They decided, for no real reason, to "tell them tomorrow." Characters also bothered me. Of course, there is the whole disappearing parents meme that's so fun in today's YA lit. The boys got very little real personality--we know almost nothing about any of them. We know quite a bit about Tory though, and she is just so stinkin' perfect. Having skipped a grade, Tory is still the smartest person in her grade AND somehow has caught the eye of the two most popular and athletic boys in school. All the girls--and I really do mean ALL the girls--hate her. Tory has several guy friends but not a single girl friend. The girls her age hate her, one woman wants to make her into a reluctant beauty queen, and one wants to kill her dead. Is there really not one nice female in all of Charleston? Apparently not. The book takes on way too much, a trend I've seen too often lately. 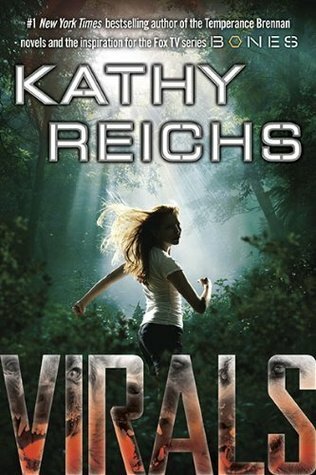 Virals really runs the gamut--we have a cold-case murder, some wild monkeys (huh? ), a brief cotillion, social class warfare at high school, medical testing on animals, nondescript "street thugs" wearing black (naturally), and environmentalism. No wonder it needed 448 pages. If I had to say something I liked, I guess it would be the...um...I don't know...maybe the Charleston and island setting. Yes, I liked the setting! Author Kathy Reichs definitely knows the area well, and her descriptions are detailed and really make me picture the area. The trailer (below) is kind of cool, too. THE BOTTOM LINE: If you like mysteries and have read absolutely everything else, you might give Virals a try. Maybe. STATUS IN MY LIBRARY: We have the first two. The third one is due out in May. I haven't read this book but it is on our middle grades Young Hoosier list for 2012-2013. My 11 year old 6th grade daughter devoured it last weekend, had to download the 2nd one to read on Sunday, and grabbed my ARC of book 3 to read on Monday. She loved the books! So, for every book...a reader! @Sherry Gick--I'm glad to hear your daughter liked this! I have the first two in my library, and I was thinking I wasted our precious library money on them since I disliked the first one so much. I think younger readers might not notice the inconsistencies in plot and logic that adult readers would.